What's the whole point? To bring a crane from Rostock in northern Germany all the way to the landlocked country of Switzerland? Imagine how many kilometers the ninety tons of steel had to travel to reach this spot at the Limmat river! The Zurich Transit Maritim exhibit even comes with an ear piercing ghost ship horn which will irregularly blast Zürich starting on May 10! Call it art, or a piece of recycled material, this dock crane is the winner of an international competition by the city of Zurich. Several years ago, the city was looking for a unique art installation that sparks a discussion among people on how to utilize public space. The crane definitively succeeded in igniting a debate! Beauty or beast, some are amused by this rusty giraffe looking down onto the rooftops of Zürich's medieval old town. 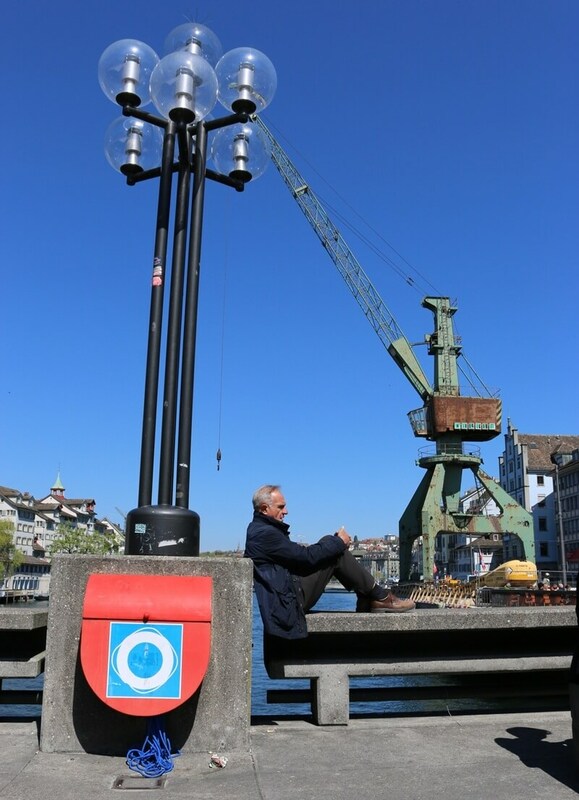 For others, including myself, the dock crane is a symbol for disposable city taxes in the amount of 600'000 Swiss francs (plus private donations). At the end of the exhibition in nine months, the sale of the steel scrap will hopefully help the city to recover financially and aesthetically. What's your opinion of the Zürich dock crane? Cuteness Alert: St. Bernard Puppies Born at Fondation Barry Lucian Hunziker – 15 Minutes of Fame with Roger Federer & Co.